Peel Ports has formally opened the UK’s first fully- automated steel terminal at the Port of Liverpool following a £9m ($13m) upgrade. The investment is a response to increasing customer demand for shipping via Liverpool and to provide both increased capacity and improved handling facilities at the existing terminal. Liverpool is the closest deep sea port to the West Midlands, where approximately half of the UK’s steel is consumed. Located at the Port of Liverpool’s Canada dock, the terminal features a fully automated warehouse and interactive customer web portal, which mean customers will have round-the-clock instant access to the ordering process. Real- time stock availability, precision coil selection and a vehicle booking system will give customers best value by minimizing back office processing and paperwork, handling, and haulier turn-around time. The terminal also includes an automatic weighing facility and instant customer reporting means that customers will be able to track their order real-time from ship to door. Supporting the investment is a new partnership with major logistics company Denholm Handling. 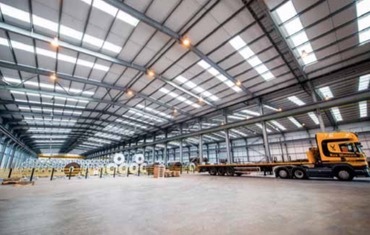 Accredited to ISO 9000, 11,000 and 18,000 standards, the site provides 24,200m2 (260,000ft2) of internal storage and 9,300m2 (100,000ft2) of external storage. There is 80,000 tonnes of capacity within the automated coil facilities and a total throughput capacity of 500,000 tonnes annually. There is 11.5m draught water alongside. A similar development is also confirmed for Peel Ports’ other steel terminal at the port of Sheerness in South-east England. Liverpool2 will allow global shippers ‘ship-to-door’ access to the UK's major import centres via the most economic and lowest carbon route, and provide northern UK-based exporters with a more competitive route to market. The £300m construction programme comprises a new quay wall, land reclamation to create the 16 hectare site, dredging of a new 16.5m deep berthing pocket, installation of eight 24-wide ship-to-shore quay cranes and 22 cantilever rail mounted gantry cranes, and associated supporting infrastructure works. Peel Ports is one of the UK’s largest port groups, owning and operating seven of the UK and Ireland’s most important ports. It handles 70 million tonnes of cargo every year. It is headquartered in Liverpool and employs around 1,200 staff. Peel Ports is part of the Peel Group, one of the UK’s foremost privately-owned investment enterprises. Its strategy embraces a broad range of sectors - land and property; transport and logistics; retail and leisure; energy and media, with assets owned or under management of more than £5 billion. Group investment policy is focused on actively managing the diverse portfolio, enhancing the quality of its assets and recycling capital over the long-term. Denholm Handling Ltd provides warehousing, handling and distribution services across the UK for importers, exporters, traders and manufacturers from 12 strategically-located sites across the UK. It is part of the J&J Denholm Group, which dates back to 1866, and offers a wide range of logistics, shipping and related maritime services.